For the first time in World Cup history the tournament was hosted in Asia, with Japan and South Korea combining to stage the tournament. Like any major tournament it's always better for the spectacle if the host nation, or nations in this case, does well and South Korea certainly did that in making it to the semifinals for the first time in their history. But their progress was not without significant controversy. 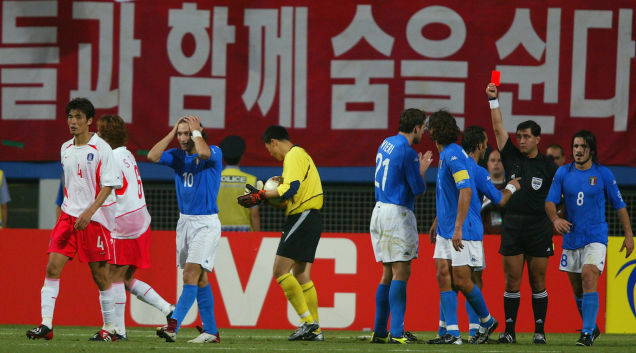 On 18 June 2002, Korea took on Italy in the Round of 16 and what was to follow still doesn't sit right with many Italian fans. In front of an enthusiastic home crowd at the Daejeon World Cup Stadium, South Korea fell behind to a Christian Vieri strike in the 18th minute and with the Italians holding firm deep into the regulation time the hosts looked to be going out. In the 88th minute, however, a mistake by Italian defender Christian Panucci allowed Korean winger Seol Ki-Hyeon in to score the equalizer. In extra time things took a strange turn though as Ecuadorian referee Byron Moreno, who was later banned for 20 matches in his own country for either a string of bad decisions, or corruption, depending upon your source, wrongly disallowed Damiano Tommasi's Golden Goal match winner for Italy. In the meantime he allowed a string of terrible Korean tackles, while dubiously sending off Franceso Totti for diving. As Ahn Jung-hwan put away a classy winner with three minutes to go in extra time, the Azzurri were left fuming. Moreno's later troubles with the footballing authorities in his own country and his post retirement conviction for attempting to smuggle 6 kilograms of heroin into JFK in New York in 2010 did little to quell the rumours of his impropriety. But despite how Italian fans remember this match for Korea though, Ahn's winner will be remembered as one of the greatest moments in their footballing history.